A 35-year-old Boise man who jumped out of a moving car Saturday night and ran across Interstate 84 to try to avoid arrest is charged with a felony count of possession of methamphetamine. Gary A. Zosel is also charged with a felony parole violation and misdemeanor counts of eluding police and possession of drug paraphernalia in connection with the case. Deputies began their investigation just after 10 p.m. Saturday in the Overland/Cole Roads neighborhood. A patrol deputy was driving behind a black Nissan sedan — which had expired plates — going north on South Entertainment Drive when the driver of that car, later identified as Zosel, took off at a high rate of speed. The deputy turned on the overhead lights of his patrol car and attempted to pull the Nissan over. Zosel kept driving and went into the parking lot of a hotel at the end of Entertainment Drive. That’s where he jumped out of a moving car and ran off. 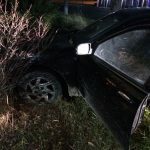 The car crashed into a fence and some bushes while Zosel ran towards I-84. He jumped over a fence and ran across several lanes of traffic on the interstate. The deputy stayed at the scene to make sure no one else was in the car or was hurt as a result of the crash. He called into Ada County dispatch so they could put out a description of Zosel, who didn’t get very far. Deputies eventually found Zosel near the pond on the Flying Wye and arrested him without further incident. A K-9 drug dog found drug paraphernalia inside Zosel’s wrecked car which later tested positive for methamphetamine. Deputies then arrested Zosel and booked him into the Ada County Jail. A preliminary hearing will be set for Zosel later this month. He is being held in the jail on a $50,000 bond.